They're not the highest quality but they give the general impression. The build is in effect complete now. There are still a lot of little improvements, tweaks and tuning to work on, and some upgrades in the works, but it is now broadly as I planned it. Home built wooden base on industrial castors for ease of movement. FDS DSTD MIP Package interfaced using a combination of FDS-SYS and OpenCockpits cards. Archen Simparts Autobrake and N1/SPD rotary switches. FDS IBL Dimmers and 12V dimmer for panel dimming and maplights. Chinese 12V dimmers for the Flood Lighting Dimmers. CustomSimParts Dual Flaps Gauge and Brake Pressure Gauge, interfaced with Polulu Servo Card. FDS PRO-MX Pedestal with FDS E-Series Radios. Interfaced with an FDS-SYS Card and a Bodnar Card for the Weather Radar rotary controls. Sismo Solutions FWD and Aft Overhead, interfaced using the Sismo Ethernet Board and Backpanels. Gauges are Sismo and interfaced with a Polulu Servo Card. Attached using FDS Overhead Mounting Kit. Archen Simparts Solenoid Held Engine Start switches, interfaced with Phidgets Relay board which also switches power to the intercom system. Simujabs Dual Linked Yoke and Rudder Pedals. 3 roughly 4-5 year old home built basic Core i3 boxes which drive the displays and CDU's. Captain PFD, ND and CDU on one, Upper and Lower MFD on the second and F/O PFD, ND and CDU on the third. 1 overclocked i7700K, GTX1080, watercooled, 16Gb Ram SSD system to run Prepar3d and ProSim. (This will be upgraded to a 1080ti next year and a further 2 identical similar boxes purchased for a wideview system). 1 touchscreen core i3 all in one PC as an instructor station/utility pc. Pixelwix 4m diameter , 2.05m high 210 degree aluminium frame with flexible polymer screen. 3 x Optoma GT1080 Projectors. Fly-Elise Immersive Calibration Pro and Immersive Display Pro for Warping and Blending. Main Software is Prepar3d v4.1 with ProSim. Most interfacing is native in Prosim, but I use SIOC for the OpenCockpits stuff and a custom program I've written to interface the Sismo hardware. 2 on the Prepar3d PC; 1 for the Prepar3d sounds and some ProSim audio ambient sounds (mainly APU, Packs, cabin ambient noise), and the other for VATSIM audio. 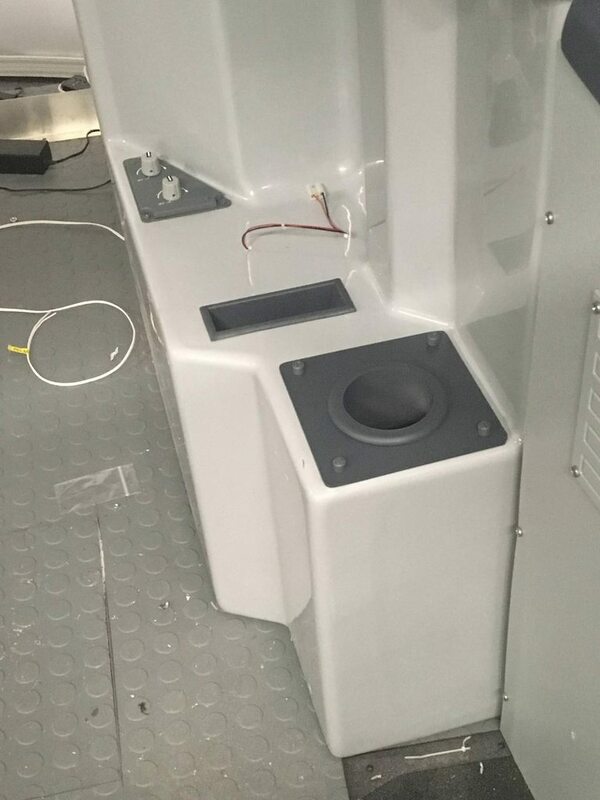 2 of the 3 other PC's are used to provide sound to the in-ceiling speakers (GPWS call outs, Marker sounds etc) and some speakers behind the MIP (avionics noise, some warning sounds). Many thanks to all the people on this forum and elsewhere for the inspiration, help and ideas, most of you I don't know in person but it's great to be part of the community. Particular thanks to all at FDS for the great service and products. They are the backbone of my sim and it wouldn't have been possible without you! I'll post some more photos/videos soon that will give a broader impression of the sim. So after a month or so of enjoying the sim, I've now stripped it down again for some maintenance and upgrades. I've been working on the sidewalls, adding in the cup holder and document holders. These are 3d printed (professionally) from designs from another FDS builder, winstonc, who has uploaded them onto thingiverse. The mounting plate for the cup holder is some 3mm plexi that I had laser cut to size and shape. First photo is the initial fit before painting. You can't see it but I've also tidied the wiring that is behind the sidewall. 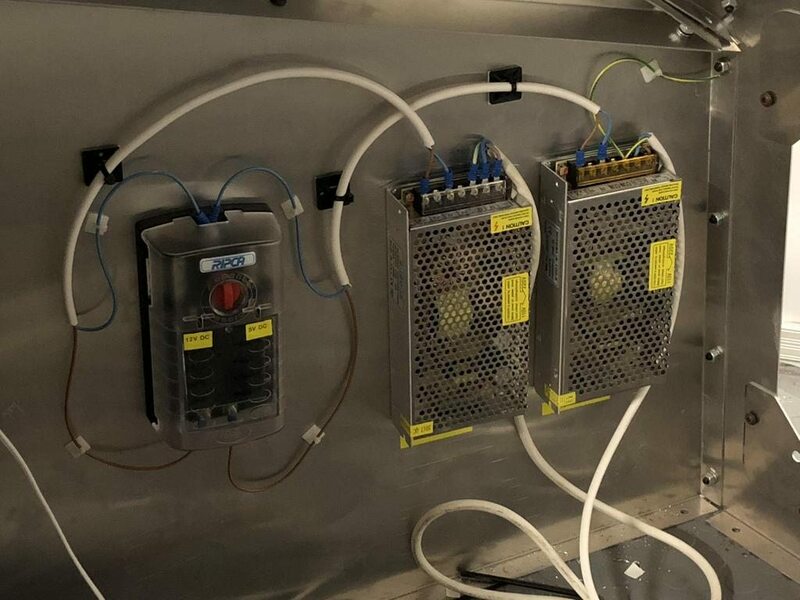 I've got the map light panels and dimmers, so there are 3 2-core cables leading out from the sidewall to connect elsewhere, as well as the new cable for the test switch on the oxygen mask panels, which are on order. All the cabling is now attached with cable clips to the back of the sidewall, and terminates in a junction box for easier connection. I've also done the same on the captain's sidewall, but also have mounted a new Bodnar card that I will be using for the Tiller axis and the push-test switches on the oxy mask panels on to the back of the sidewall as well. 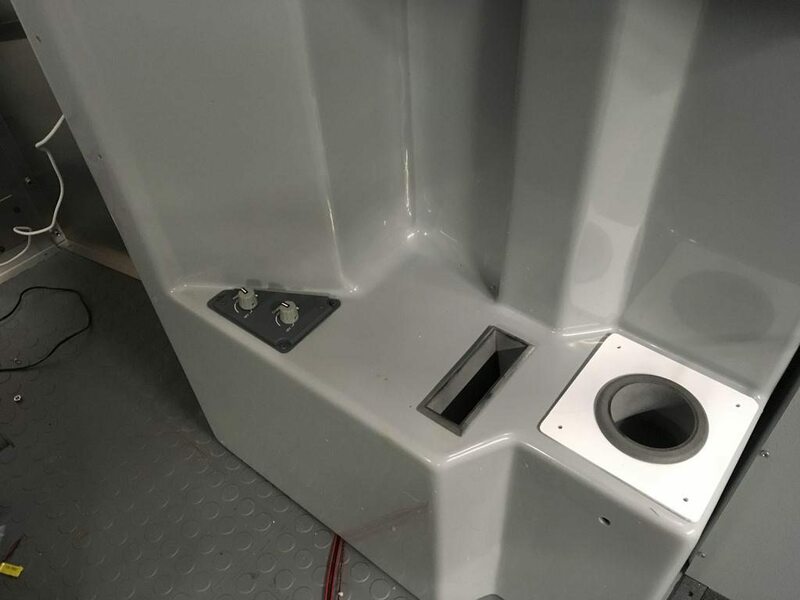 Previously the tiller was connected to the Bodnar card that is on my rudder pedals, so this is reduces the amount of cable trailing around behind the MIP. This side will supply all the LED flood lights, IBL backlights and so on that use PWM dimming. I am separating out all components that use PWM and powering them with separate supplies because I was having various issues, such as audio interference when connecting everything to one common supply. An almost identical installation on the opposite side of the shell will provide supplies for the other components. Will provide another update in a couple of weeks with more progress. Glad you liked the cup and map holders. Posted: Tue Mar 20, 2018 9:47 am Post subject: Re your ARCHEN STARTER Switches. Simon, Re your ARCHEN STARTER Switches. Hey, great job Simon. I've been building for many years & still not finished. I note in your build you are using the above Starter Switches. I also have the same Starter Switches but not installed yet. Could I please ask you if you wouldn't mind providing me with the exact way to wire these up to the Phidgets Relay Board & can you pls tell me which Model Phidgets Relay Board do I need? Do I need to get special software to operate the Switches? I note that my last Sim-A update v1.85 also installed Phidgets, is this all I need? But how do the Relays get their N1 data or or rather what activates the Relays? Sorry for the delay in responding, I haven’t checked the forum for a few days. In terms of controlling the starters, I use ProSim software so I can’t help in terms of SimA, but I’m sure someone else can chime in. I use a Phidgets 0/0/4 Usb Relay card. Wiring is straightforward; I take the 12v +ve line into the Common of one of the relay terminals. Then a feed from the ‘Normally Open’ terminal on the relay into the solenoid on the start switches, and then back to ground from the solenoid. Important thing is to put a diode across the +12v/GND feed on the solenoid ; Anders supplies the diodes and a diagram showing where and in which direction to put the diode. I don’t have access to the sim at the moment but a picture won’t help much; it’ll just show a bunch of wire and a terminal block. Are you saying connect the diode across the Pos & Neg cables?